Expect An Autumn Of Outrage: Both Parties On Offense In Bruising Midterm Campaigns As the summer winds down and the fall campaigns gear up, it appears both parties plan a strategy of criminalizing the opposition and calling on the faithful to cleanse the nation's capital. President Trump speaks a rally Tuesday in Charleston, W.Virginia. As the world now knows, former campaign chairman Paul Manafort was convicted on eight counts of tax and bank fraud by a federal jury in Virginia. Yet, hard as it is to believe, that was not the worst story for the president in the news on Tuesday. In the same hour, in a federal courtroom in New York City, Michael Cohen, Trump's longtime personal attorney and fixer, pleaded guilty to eight counts that included campaign finance violations among other crimes. Cohen also told the court some of his actions were taken at the direction of then-candidate Trump in 2016. And, as if to round out the day, a federal grand jury in San Diego indicted a veteran congressman and his wife for misuse of $250,000 in campaign funds. That congressman, Duncan Hunter Jr., had been the second House Republican to back Trump for president. The first, Chris Collins, was indicted in New York earlier this month for insider trading. 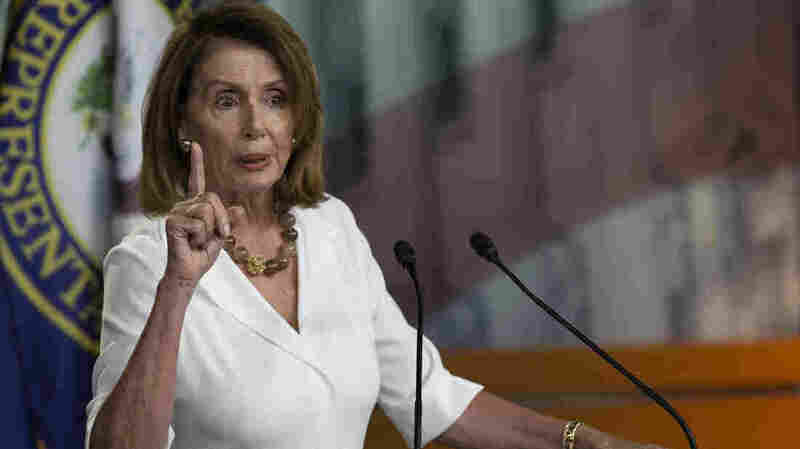 As the most important midterm elections in recent memory take shape over the next 11 weeks, Democrats will run this fall against the corruption allegedly rampant in the ruling party — what their House leader Nancy Pelosi has called "brazen corruption, cronyism and incompetence." That worked well for them the last time they displaced Republican majorities in Congress, in 2006, when the GOP was burdened with lobbying scandals and a whiff of sexual misconduct involving a House member and underage congressional pages. But if the Democrats plan to run against Manafort, Cohen, Collins and Hunter, the Republicans are just as determined to run against Cristhian Behana Rivera. That is the name of the undocumented immigrant arrested in the murder of 20-year-old Mollie Tibbetts, a student at the University of Iowa. Rivera's immigration is in dispute — with law enforcement authorities and the Trump administration contending he is undocumented and his lawyer saying in court documents that he is working in the state legally, according to the Des Moines Register. How important is the Tibbetts story to the Republican playbook? For starters, it was the lead story on Fox News on Tuesday evening — reported ahead of the Manafort and Cohen developments. 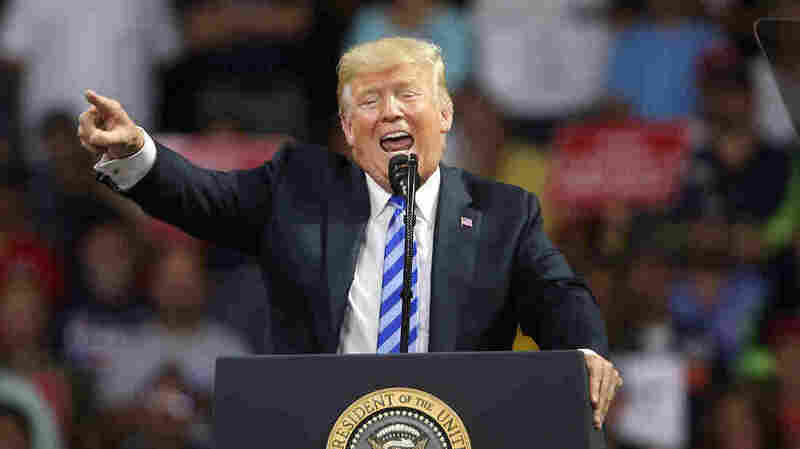 Trump highlighted the Tibbetts story when he talked about illegal immigration in West Virginia Tuesday night. He used it to characterize the platform of the Democrats. The crowd chanted "Build that wall!" And when White House press secretary Sarah Sanders came to the lectern on Wednesday she wasted little time getting to the Tibbetts case, tossing in a biblical reference to add gravity. And the Trump Train twitter account sent out a picture of Tibbetts labeled: "Thanks to the Democrats." So as the summer winds down and the fall campaigns gear up, it appears both parties plan a strategy of criminalizing the opposition and calling on the faithful to cleanse the nation's capital. One reason both parties reach so readily for accusations of criminality may be that neither party is confident enough in the rest of its arsenal. Republicans had thought they could win this year on the tax cuts they passed last winter. Those deep cuts were supposed to fuel the economy and make "the forgotten man and the forgotten woman" see real gains in disposable income. But polling data suggest the cuts, while are a gold mine for many high-income categories, have not made as much difference for average workers. Or, at least, they have not yet convinced many of those workers that they're doing that much better. The president and his party had also thought — and continue to maintain — that the overall robustness of the economy should rub off on Republican candidates. Indeed, the current numbers — historically high growth and low unemployment — are classic political assets. But the problem seems to be that, again, the uneven distribution of the benefits remains a political hurdle. Those benefiting most from the record highs in financial markets are those who were not hurting in the first place. Where jobs have been returning and/or wages rising, Republicans have a case to make. But in those places where jobs are still scarce and real income remains far below the levels of a generation ago, the political payoff may be limited. A third disappointment in this regard is the emergent effect of tariffs on sectors of the economy. Some farmers are losing global sales, while users of steel and aluminum are feeling the pinch of higher costs due to higher duties imposed on their raw materials. The pain may prove worthwhile in the long run, but the midterms are in roughly 11 weeks. Meanwhile, the combination of lower tax revenues (primarily from corporate taxes) and higher federal spending has driven the annual budget deficit back to the trillion-dollar-a-year level briefly touched in the depths of the recent "Great Recession." So, perhaps we should not be entirely surprised that the strong economy has fallen short of being a magic wand in political terms. House Minority Leader Nancy Pelosi, D-Calif., speaks with reporters during her weekly press conference at the Capitol on July 12, 2018, in Washington, D.C.
Democrats for their part had expected the usual effects of midterm swing to carry them back to power this November. After all, since World War II, every U.S. president but one has seen his party lose House seats in his first midterm election (the exception was George W. Bush in 2002, right after the 9/11 terrorist attacks). Barack Obama lost more than 60 in his first midterm. The average House seat loss for all presidents in midterms since polling began is 36 when presidential approval is below 50 percent. The Gallup Poll done last week had Trump at 42 percent. And Republicans have seen more than 40 of their incumbents retire or run for other offices this year, including Speaker Paul Ryan and the chairs of eight committees. But as it turns out, those historic guidelines — like so many other norms these days — may be less applicable in the Trump era. For one thing, the usual arc of the partisan pendulum could be altered by the party-friendly district maps drawn by Republican legislatures and governors earlier in the decade. Both parties have always use gerrymandered districts to protect incumbents and press their Election Day advantage. But computers and sophisticated software have made that process far more efficient and effective. Moreover, the voters who turn out in midterms (as well as in presidential years) tend to be older, male, more affluent and less diverse. That fits the profile of voters who tend to favor Republican candidates (and who approve of the president). Whatever these voters may think of Trump personally, they will vote to protect him and his program because they believe they are protecting themselves. That means whatever momentum Democrats think they have, they will be met by voters who may be equally determined. The minority party will need to build not just a fire but a major conflagration under its own voters to generate the results they want. It must also be said that while Congress is not popular (approval rating at 12 percent in a recent tracking poll by YouGov and The Economist magazine) its problems are not seen as exclusively Republican. And the majority party is just as willing as the minority to take the fight to the opposition on immigration and abortion and other issues with high emotional impact. So while Democrats thought the GOP would be hunkered down for a pounding this year, the Republican sense of reality is quite different. Perhaps this too should not be surprising. The divisions in America, promoted by partisan cable news and social media, have rarely seemed so visible and visceral. And they are all the more difficult to address when embodied by a single political personality who seems to thrive on them.